In The Bloedel Reserve: Gardens in the Forest (1988) Lawrence Kreisman traces the history of one of Bainbridge's best-known attractions, including the history of the two families - the Collins and Bloedels - who shaped the reserve. Historic photographs as well as colorful contemporary views of the garden accompany the text. 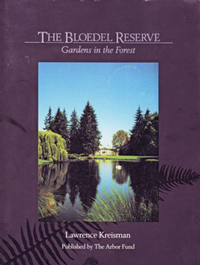 A copy of The Bloedel Reserve can be found in the local authors collection of the Bainbridge Public Library.